In Podcast #14, we'll have an interview with Faroese Prime Minister Kaj Leo Johannesen. The interview and the rest of the podcast will hit the web later this week. In this episode, we hear some music from this Summer's G! Festival, speak with a woman who paid a brief visit to the Faroes, and eat some fast food. 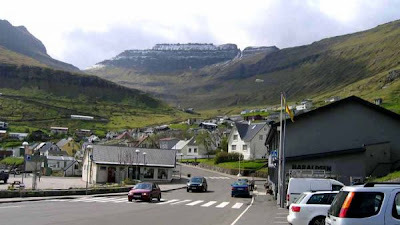 Spring has come to the Faroe Islands, and that means, well, temperatures in the 40s this week. It has been cloudy and soggy lately, but things change quickly this time of year. The biggest changes come in the length of the days. Today, the sun will rise in the Faroes at 4:55 AM and set at 9:54. Twilight starts at 3:49 AM and ends at 11:01 PM. But in just ten days, twilight will start at 3:06 AM and end at 11:44. (Once the sun is up, I know that's not twilight, but my point is there's some kind of light in the sky for that whole period of time.) That's an increase of about 90 minutes of light. From the start of June until the middle of July, there's some light in the sky all day and all night. By July 22nd, twilight begins at 2:45 in the morning and ends around 12:15 the next morning. Sounds wonderful. Indeed, I wouldn't mind seeing that long, drawn out sunset on July 22nd. Hmmmmm. This week's Faroe photo is of Fuglafjørður and was taken just a few days ago by Jenny Henkie, who's visiting the Faroes right now. Apart from some great pictures, her site has a feature that will tell you when the sun rises and sets in the Faroes on any given day. And as you can probably tell, I've already spent a lot of time playing around with it.